In the latest episode of the WAVE award-winning show “Veterans Helping Veterans,” host Sheryl Shaffer takes viewers to the March Air Reserve Base to meet a special guest. 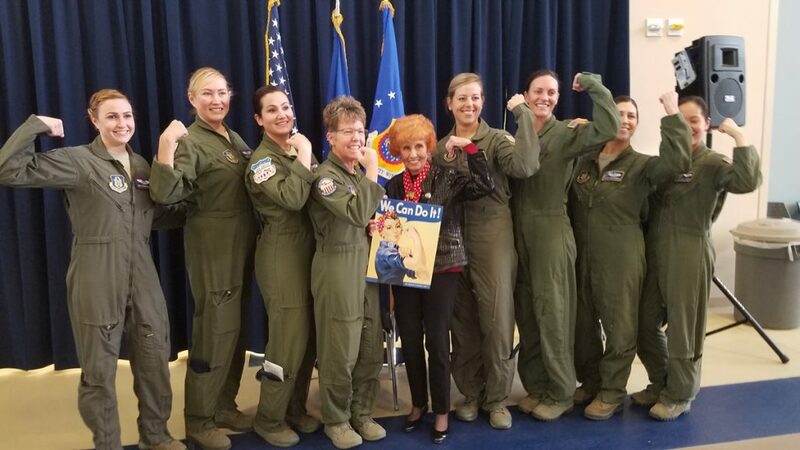 Elinor Otto, one of those Rosie the Riveters depicted on iconic morale-boosting wartime posters, is now 98-years old and was honored at a special event on and above base. As a pioneering Rosie the Riveter, Otto embodied female strength and readiness to work hard for her country during World War II and after. Otto built airplanes for 68 years and has become an inspiration to younger generations of women. The 452nd Air Mobility Wing at March Air Reserve hosted a C-17 flight with Rosie the Riveter. Veterans Helping Veterans producer Shaffer got to ride along on Otto’s first flight in an aircraft that she helped to build. During the flight, an almost all female crew demonstrated what takes place during an air medical evacuation. Patient dummies were given emergency treatment in the plane’s roomy interior while inflight. The event helped introduce girls to careers in the Airforce and in Science, Technology, Engineering and Math (STEM) fields in general. Back on land, Cadet Airman First Class Abigail Spitler interviewed Elinor Otto in front of a small audience of young women and appreciative service members. Spitler asked what changed for women after they were allowed to work in traditionally male jobs during the war. Otto had done several mundane jobs like clerical typing and waitressing before the war. Once she was trained to rivet airplanes, she found she enjoyed doing that type of work. According to Otto after the war, the working women were happy to give up their jobs to men who were lucky enough to come back home. Otto tells Spitler, “They didn’t tell us that we did anything good,” referring to her time as a riveter. Years later, Otto has become a big deal and important part of history.